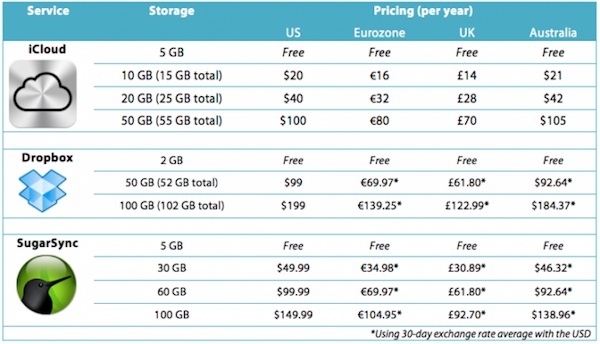 "With the iCloud price tiers revealed yesterday, Federico Viticci of MacStories.net has done a nice job comparing Apple's cloud storage offering to those of Dropbox and SugarSync, two of the most widely used cloud storage services out there." The chart is nice comparison in several different denominations. From what I can see, it appears that SugarSync is actually the best deal. What storage solutions do you use, and with the details of iCloud out in the wild, is that going to change what you do in the future?